Run­ning to the USA and return­ing after only 8 days made it a wild trip and exhaust­ing trip for sure. But it was good to be able to max out my time with my parent’s, and help them as much as I could while there. My Mom was admit­ted to the Eagle Lake Hos­pi­tal in the mid­dle of the night last Wed. with a 790 blood sugar (120 is nor­mal) caused by 2 dif­fer­ent infec­tions in her lungs and blad­der. She is bet­ter after 2 days of intense treat­ments. I want to thank all of you for your prayers, emails, and phone calls for emo­tional support. (my 3 woman mis­sions team) HARD AT WORK BRINGING IN THE FINAL 100 TONS OF CORN My team of Balama Blaz­ers includes : Katie Pol­cyn of Seguin, TX Han­nah Gilman of Vaughn, WA Ash­lynn Gra­bill of Pueblo, CO It is excit­ing to get to know these 3 young ladies, and to watch them work. Noth­ing but the bugs and snakes seems to slow them down. Tee Hee. This photo from our files shows the corn being processed. Katie and Han­nah are old hands at corn pro­cess­ing after help­ing with the June corn. Ash­lynn was AMAZED to say the least at how mas­sive an oper­a­tion it is to orga­nize a 72 man crew. By the 2nd day, she was flow­ing well with the group, and enjoy­ing our spe­cial break­fast of FRIED BEAN PATTIES made by our cook. These bean pat­ties are a treat we only get dur­ing food buy­ing, and they are delicious. 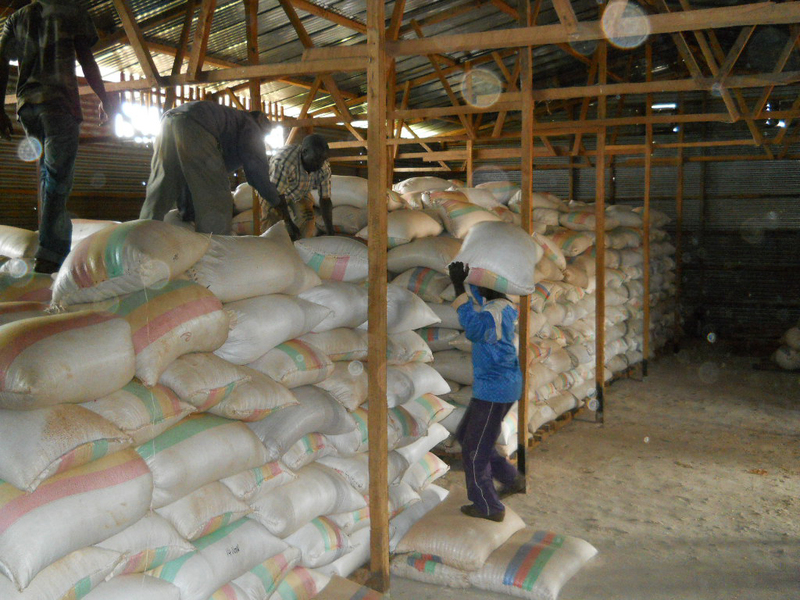 These young girls share the cron grind­ing chore. Last week our 2 trucks hauled in 50 tons of corn and the other 50 will roll by July 30th for the grand finale! Then the fun begins as one of our trucks will leave for Meluco on Wednes­day with sup­plies to dis­trib­ute to our orphans in Meluco. Busy is our mid­dle name around here. 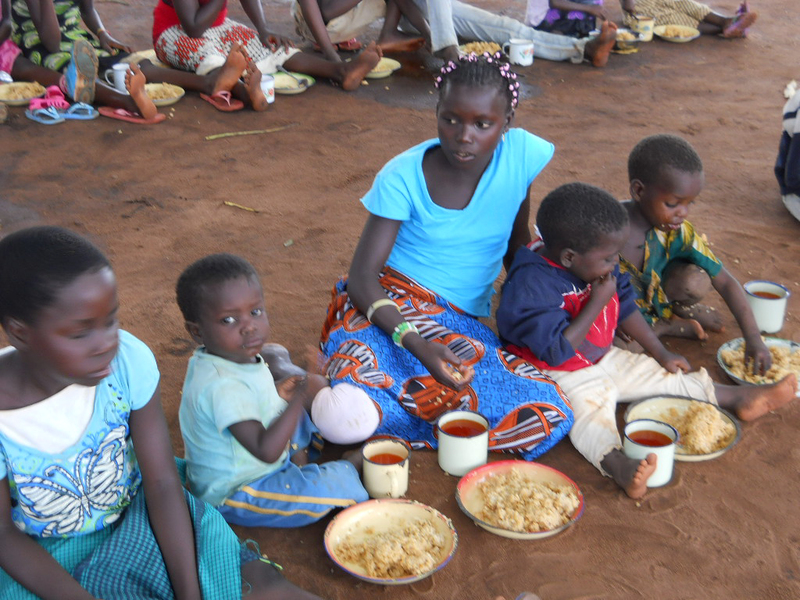 Happy chil­dren enjoy a din­ner of freshly ground cornmeal. FRIDAY WAS BALAMA DAY A County wide hol­i­day only, so the girls and I had a girl’s day out by dri­ving to the town of Mon­tepuez, 30 miles away, to fetch sup­plies for the kids and have lunch at the local café in the park. No ham­burg­ers were pos­si­ble, (we were all greatly dis­ap­pointed), so we all set­tled for omelettes with french fries and salad. The local honey bee pop­u­la­tion kept us all enter­tained, as 6 bees con­stantly buzzed our heads, and finally 1 fell into Katie’s glass of Fanta orange. Those bees love any­thing sug­ary for sure! Besides the shop­ping, we had hoped to find HIGH SPEED INTERNET in Mon­tepuez, but were greatly dis­ap­pointed since even the cap­i­tal city, Pemba, is hav­ing mas­sive inter­net prob­lems. So know that none of us can open FACE BOOK or send/receive pho­tos at this time. I’m using the old slow inter­net from the local Moz. server but it can only send/receive text mes­sages. So feel free to write me a note, as I love get­ting mail from all of you. No one knows how long it will be before the high speed is back. Such is life in the bush. BLIND WIDOW MEETS JESUS BUT HER 4 ORPHANS ARE TAKEN IN BY SISTER WITH 7 OF HER OWN! God made some women to thrive on car­ing for chil­dren. Juliana is one such woman and I take my hat off to her. Ali is the tall boy to the far right in the pic­ture above. The three lit­tle girls in front of him are his orphaned sisters. When her sis­ter died July 1st, leav­ing Ali 15, and his 3 sis­ters (Rominda 10, Nulu­mile 8, and Toma­sia 5) orphaned, Juliana did “what Jesus would do”, and took them into her fold. Hav­ing lit­tle her­self didn’t’ mat­ter. But JESUS KNEW and we were noti­fied, as they are mem­bers of the Rovuma church. 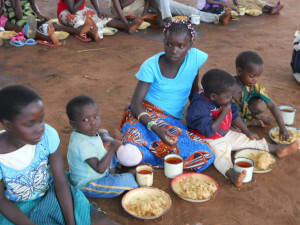 Pas­tor Joaguim called me early last Sun­day a.m., set­ting Katie and Hanna into motion help­ing me gather food, blan­kets, grass mats, and larger cook­ing pans, which we deliv­ered to her Sun­day Noon. Her mud hut is lit­tle more than a store room with a bed in it, and I was told that her 7 chil­dren sleep hud­dled together on the dirt floor as they had no grass mats, beds, or blan­kets. 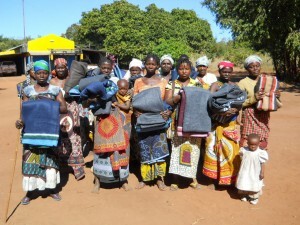 At the moment, there is no place for beds in her small mud hut, so a 2nd mud hut is des­per­ately needed. Cost $500. That will give them enough room to have beds, and get them off the cold, hard packed dirt floors. 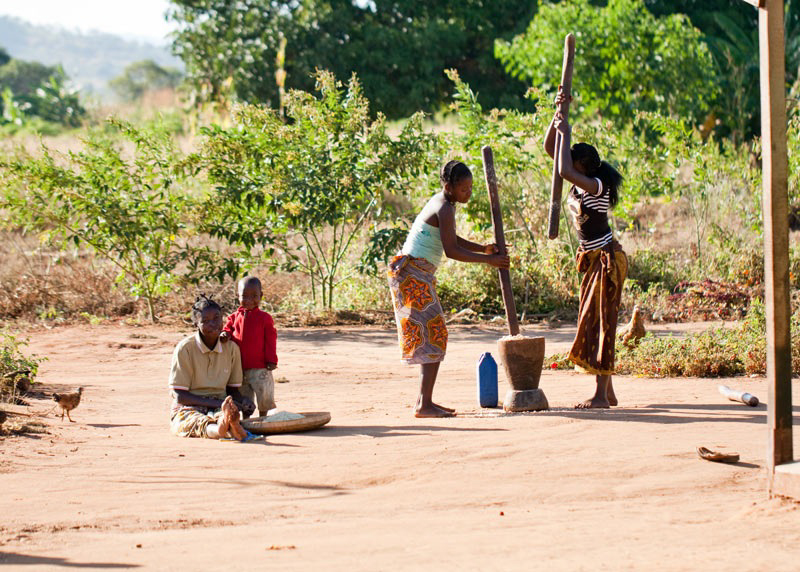 I’ve stepped out in faith and have 2 men mak­ing the 1000 mud bricks which are needed to build a house. They will be ready in 3 weeks. 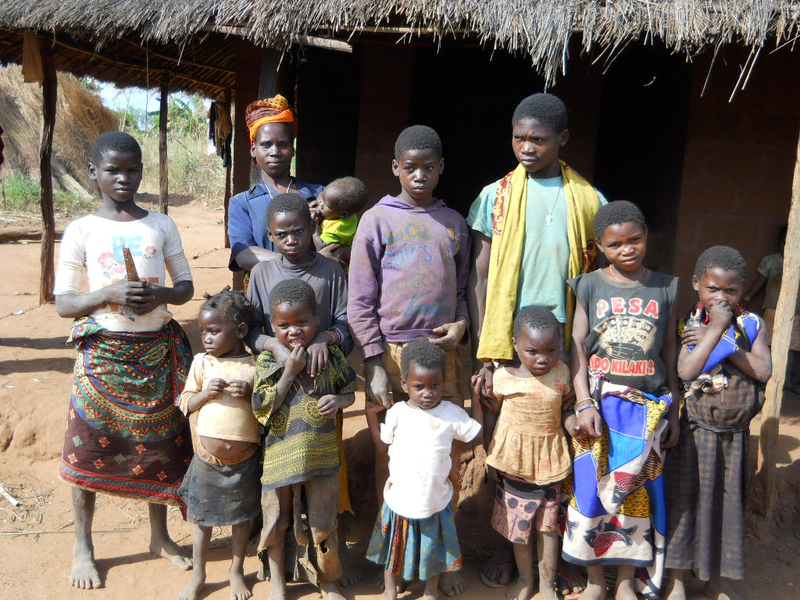 If God leads you to spon­sor a house or one of these orphans, please drop me a line, as these chil­dren truly need a bet­ter place to sleep. At the moment, they are all crammed into 2 small rooms, sleep­ing on the floor like sar­dines in a can. THANKS to a VERY gen­er­ous gift, we were able to pur­chase the best blan­kets avail­able in our area. BALAMA is suf­fer­ing the cold­est “win­ter” in the his­tory of it’s being, accord­ing to the “old timers” in this area. Since we have no heat in our homes, my house is a brisk 51 degrees F. (13 C.) INSIDE EACH MORNING with a 10 mph wind blow­ing through the screened win­dows! 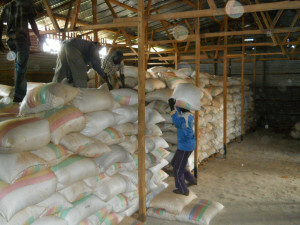 The peo­ple of this area have only thin cot­ton cloth­ing, and are used to 90 degree F. (31 C.) or higher temps. Res­pi­ra­tory ill­nesses and burns (from being too close to a fire try­ing to get warm) are the most com­mon med­ical prob­lems we see in June and July. The blan­kets allow our chil­dren to sleep warm, which helps to keep them healthy. 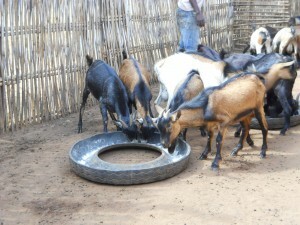 Goats rel­ish sup­pli­men­tal feed­ing of grain from “split tire” troughs. Goats are at a pre­mium since we now have 1 of only 2 herds in this dis­trict. 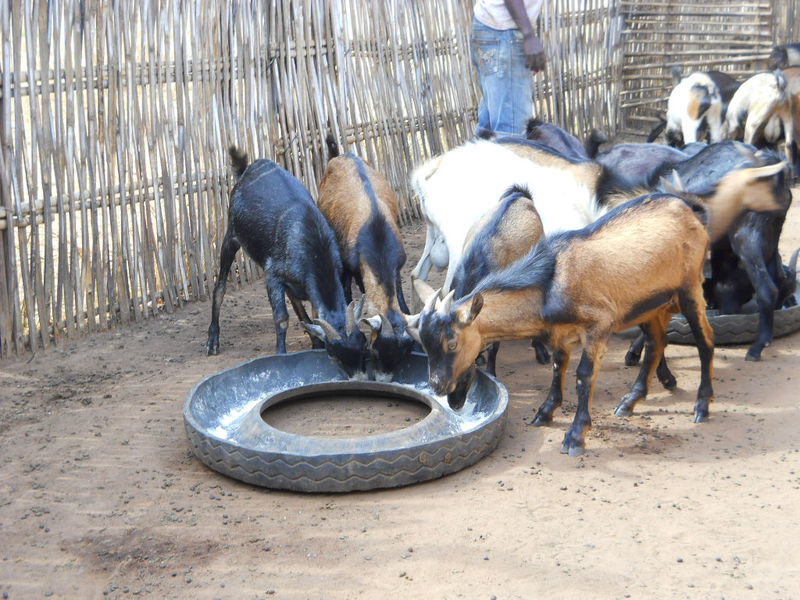 Since our graz­ing land is hav­ing to sup­port more goats (since last year’s babies now eat), I researched how to SAFELY give then ground corn in the dry months when for­age is lim­ited. Our men did a great job of cut­ting up some old nylon tires (with an 8 inch hand held knife and water to help the knife slide bet­ter). The goats each get only a small amount of grain sprin­kled with salt. Ben­e­fits, are health­ier goats that gain weight quickly, and pro­duce a more ten­der meat. ROCKS IN BUNNY’S FOOD, BREAKS A FILING I’ll be head­ing to South Africa for a quick den­tist appoint­ment on Mon­day, July 7th. Will return with a suit­case full of essen­tial good­ies and YES, I will do my best to eat all the ice cream I can man­age. Tee Hee. It is peak win­ter in the mile high city of Johan­nes­burg where I will be, so this bunny is scram­bling to bor­row warm clothes since Bush Bun­nies don’t come with thick fur coats! God’s Many Bless­ings to all of you, and MUCH THANKS for your FAITHFUL LOVE GIFTS that are so essen­tial to the con­tin­u­a­tion of our child res­cue and evan­ge­lism work.